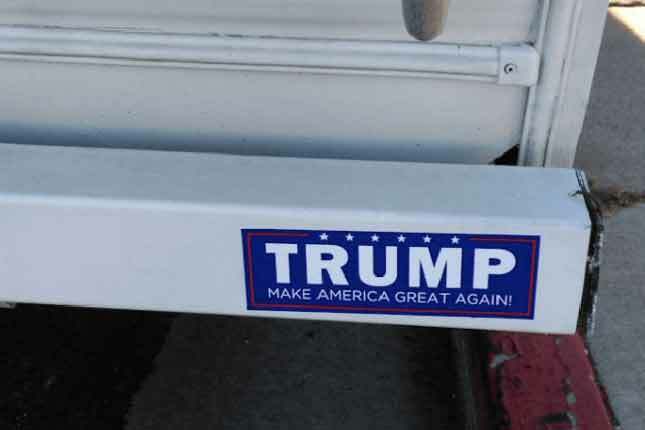 A California man says his truck was set on fire after a stranger saw his pro-Donald Trump sticker on his truck and yelled expletives against Trump. Hao Lee took his 2-year-old son fishing in Sacramento and parked his truck, a white Dodge Ram that displayed two Trump stickers on its bumper, across the street. “About a couple hours into fishing I heard someone yelling out ‘F’ Trump,” Lee told KTXL. Lee and his son were near the edge of the river, only 50 yards away from where his truck was parked. “After that I heard glass breaking, I called 911 and a couple of minutes later I saw smoke,” he said. Lee didn’t move from his spot near the water, because he wanted to make sure his son was safe. By the time Lee approached the truck, the commotion and voices were gone and his truck was up in flames. “I didn’t think anyone would do this kind of stuff over bumper stickers. It’s not right,” he said. Arson investigators with the Sacramento City Fire Department searched the scene for clues. Police didn’t say if anything was found in the scorched vehicle. There have been several recent cases of vandalism against Trump campaign offices. An office in Denver was vandalized twice in the same day on Friday, according to CBS News.